On the 30th May 1884 at Blacksod Bay, Anthony and Ellen (McAndrew) Noone along with their 10 children Bridget 17, Pat 15, William 14, Michael 13, Ellen 11, Mary 8, Anne 6, Cath 5, Ned (Edward) 4 and Peter 8 months, boarded the “Allan Line” steamer SS Prussian. When the anchor was lifted on leaving Blacksod Bay, the Prussian did not call at Galway. As Blacksod Lighthouse and Achill Island faded into the distance, the ship headed straight across the Atlantic Ocean, “next stop” being the Port of Boston, 9th of June. Anthony, Ellen and Family had an onward destination stated as Warren, Rhode Island. In Rhode Island, members of the Noone (Noonan) family worked in the Textile Mills. By 1900 the family were living in New Bedford, Massachusetts. Anne Noonan is a Granddaughter of (Ned) Edward Noone, who left Tallagh Belmullet aged 4 years old. Anne and husband Jim travelled from Westport, Massachusetts, to visit the birthplace of Anne’s Grandfather, Great Grandparents and generations before them. Other local families by the name of Phillips, Bourke and Doherty, were also travelling on the same voyage to the Textile Mills of Warren, Rhode Island. 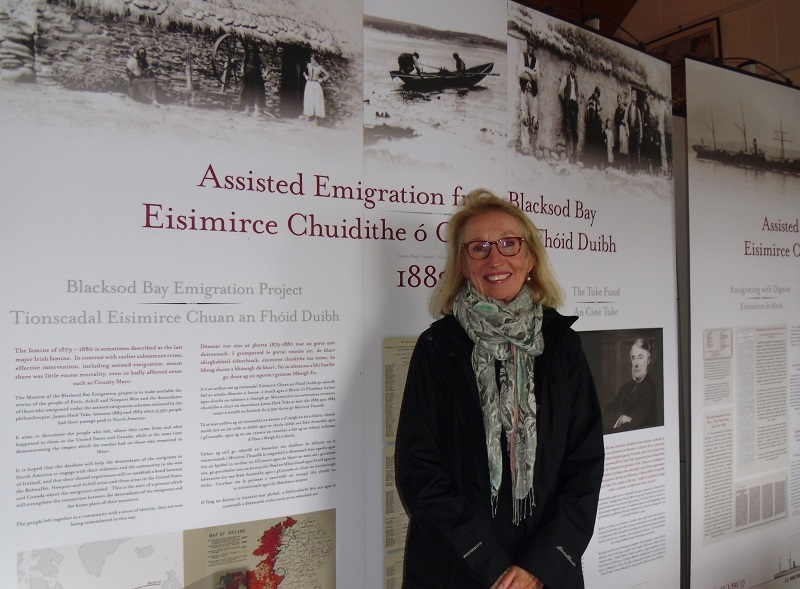 We thank Diane Heveran Rothaar for the many comments, left on our main www.blacksodbayemigration.ie site, regarding the Warren, Rhode Island and Erris families. Diane, a descendant, of Philip and Mary Heveron, Doolough (who also travelled out to Warren, Rhode Island onboard SS Waldensian), is in turn helping other descendants. It was lovely to have met you on your recent visit to the Ionad Deirbhile Heritage Centre in Aughleam, Belmullet, and to the Townland of Tallagh, Belmullet, where your Great Grandfather Anthony Noone, His wife Ellen Mc Andrew-Noone, their family left for R. I. USA.